The following is a partial summary of the conclusions from the fxempire.com weekly analysts’ meeting in which we share thoughts about lessons to keep in mind for this week and beyond. Although Alcoa’s (AA) earnings report (last 2 weeks ago) signals the start of earnings season, that first week has few other big name releases. Thus this past week, the second week, and the third one this week, comprise the heart of earnings season and exert the most influence on markets. After the first full week of earnings by the big names, the tentative picture is that the fourth quarter was decent but not great despite signs of improving economic activity. The absence of strong forward guidance for Q1 2014 has also been a mild negative to help explain why earnings season has not lifted stocks much. The lack of upbeat forward guidance is partly due to the fact this week’s earnings calendar was heavy with leading financial companies, which don’t typically provide much forward earnings guidance. The latter is owed in part to the fact that the financial companies factored prominently on this week’s earnings calendar and they don’t typically provide specific earnings guidance. Thus it’s no surprise that the major US and European indexes (ex-the periphery, which did better) made little overall progress this week. 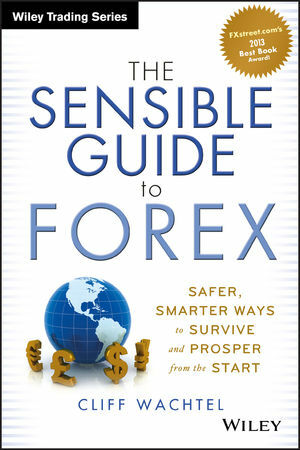 For example in the US, the S&P 500 fell 0.2%, the DJIA rose just 0.1%, and the Nasdaq was up 0.5%. This week should bring more forward guidance for Q1 2014 because a larger number of industrial and technology firms will be reporting their earnings, and that may offer some new sense of direction for investors. This week concludes the third week of US (and Europe’s) earnings season, after which time the overall picture is usually set and earnings becomes less influential on US and global markets. 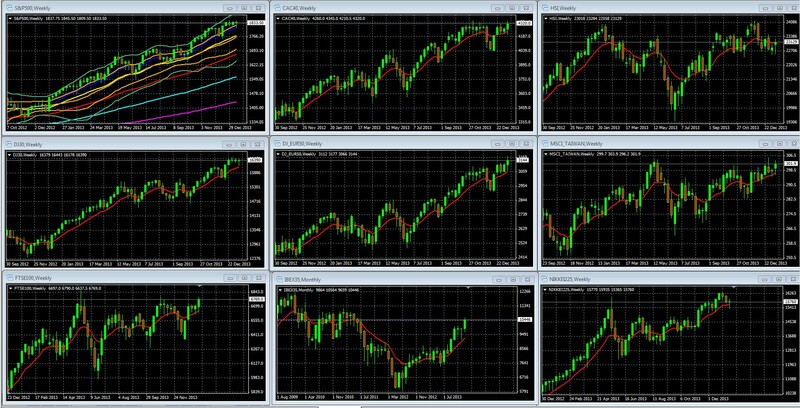 As global stock markets in most of the developed world outside of the EU remain near decade or all-time highs despite the lack of similarly stellar fundamentals like economic and earnings growth, the debate about the durability of the rally continues to yield lessons worth learning. As always, who you believe depends upon which valuation methods you trust, how you see earnings and growth prospects, and how quickly you believe rates will rise. Here’s a quick rundown of some of the latest opinions out, on both market valuation and macro-economic environment. Goldman Sachs’ David Kostin published a bearish note about the stock market’s valuation, calling it “lofty by almost any measure.” See here for details. Granted, saying markets look over-valued is not a claim that markets are in an unsustainable bubble, especially given the current still historically low interest rate environment that leaves most of us who are seeking passive yield few alternatives. Lakshman Achuthan of the Economic Cycle Research Institute (ECRI) said back in 2011 that the U.S. was doomed for a recession, and in late 2012, said that the recession started in mid-2012. This conflicts with the NBER, which has not declared a recession since early in the GFC, and the BEA, which hasn’t reported two consecutive quarters of negative GDP growth. The essence of his argument is that the economic data collection agencies have a long track record of having to make big revisions to past data, so that Q4 of 2012 and 2013 could easily still end up showing negative growth. Looking past the debate on his past recession call, here’s a summary of his current bearish view of the US economy. First, Jobs Growth Isn’t Nearly As Robust As It Appears To Be. OK, let’s pretend December didn’t happen, and focus on the trends. In the preceding 12 months we created 194K payroll jobs per month, but only 101K per month according to the household survey. Which is telling us the truth? 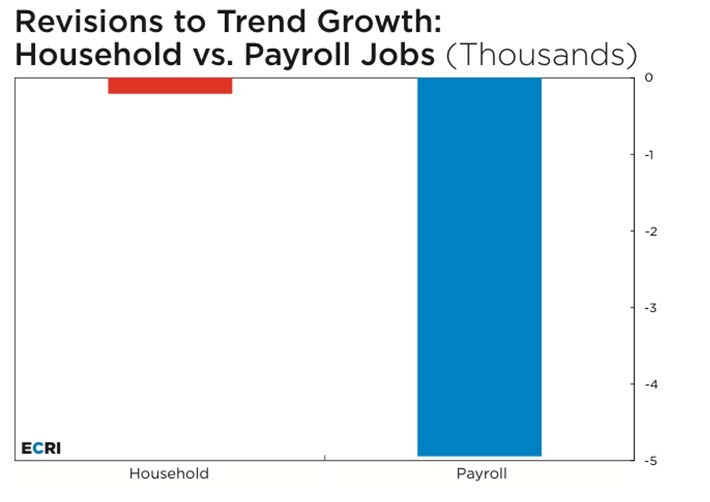 Remember, the 12-month average of job growth has been revised down substantially over the past decade for payroll jobs, but hardly at all for the household survey, only 1/25th as much (see attached chart). And something that nobody seems to have noticed is that the household survey, adjusted to the payroll concept, actually shows a decline in employment since the summer. Bottom line: even ignoring the December jobs data the trends are getting noticeably worse, especially for data not subject to major revision. 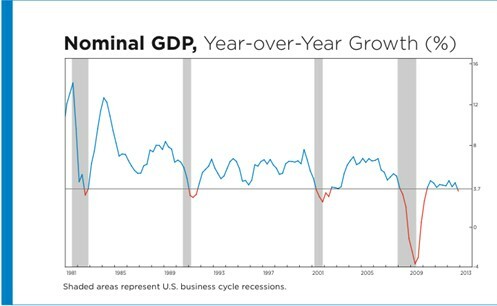 The chart below of year-over-year nominal GDP growth, after last week’s revision of real GDP growth from -0.1% to 0.1%, shows GDP is still down to 3.5%. This chart begins in the early 1980s. Based on the full 65 years of historical data, nominal GDP growth below 3.7%, which is marked off by the horizontal line, has always occurred in a recessionary context – without exception. 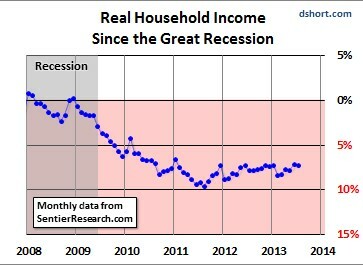 This chart is consistent with a mild recession. Yet, we have all heard lots of commentary that we’re in a “2% economy” – not that great, but as long as the economy stayed above recessionary stall speed it would be okay. concluded that the best stall-speed measure may be the two-quarter annualized growth rate of real GDI, and when that measure fell below 2% it was a recession signal, because the economy would stall out. 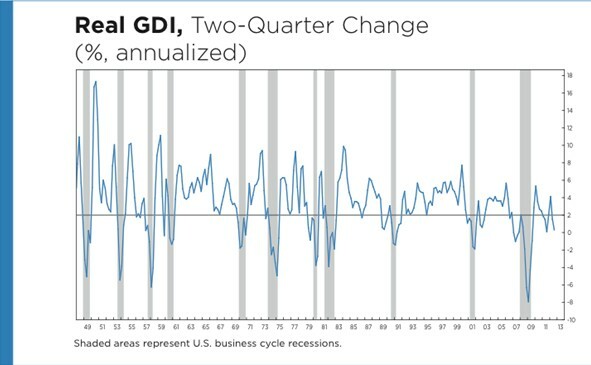 Here is a historical chart of the two-quarter annualized percent change in GDI, with a horizontal line placed at the Fed’s 2% stall- speed threshold. You can see why they believe that historically that has been a fairly reliable recession signal, because it has never dropped clearly below that threshold without there being a recession. It is not unusual to see this measure drop below the 2% stall speed, pop up briefly, and then fall back as recession begins. So where were we in 2012? All the way to the right of this 65-year chart we see this measure decline in the second quarter of 2012 to 1.5%, below the stall-speed threshold. And in the third quarter of 2012 it dropped further to 0.4%. So by last summer it had already spent two quarters below stall speed. See here for further coincident recession indicators. Bottom Line: Achuthan says that for the government is focusing on the wrong numbers, regardless of whether it does so in good faith or not. Despite the criticism he’s had on this call, it’s hard to dismiss it, given that real incomes have fallen since the start of the GFC, by around 7% per Doug Short here as per the chart below. Bob Doll of Nuveen and Richard Bernstein had the most prominent bullish comments out this week. He provided another take on the whole valuation issue, saying that in times of speculative bubbles, high beta stocks (those most sensitive to overall market movements) should show historically high valuations, yet in fact he sees their valuations are conservative versus those of lower beta, theoretically safer stocks. 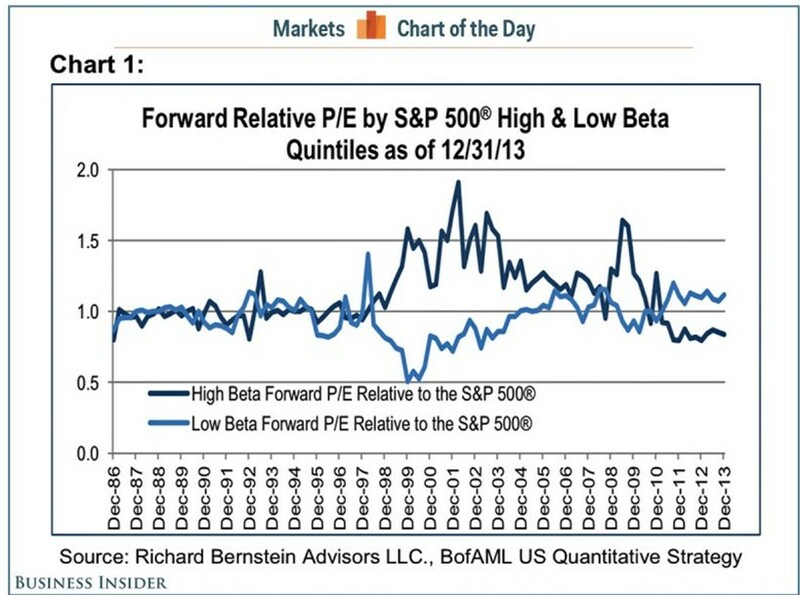 He illustrates his point with the chart below that crashes tend to come when high beta stocks are richly valued. He goes on to provide additional measures of market valuation that suggest markets are not overvalued. Markets today don’t have most of the traits that characterize valuation bubbles. S&P valuations per the Shiller Cape, Inflation & Subsequent 12 Month S&P Returns suggest that the S&P 50 is not at bubble valuations. Current market sentiment lacks the euphoria that accompanies stock market bubbles. Our take: as long as fixed income investment rates don’t start spiking, and are believed to be in only a very gradual ascent; stocks will find support from long term investor – yield seekers who have few options. Democrats got: funding for Head Start restored, sequester-easing funds for job training and NIH, and a modest raise for federal workers. Republicans got: no funding for the IMF, no additional expenditures for Obamacare, plus $20 billion in restored funds the defense budget. In sum: discretionary spending in inflation-adjusted terms, is cut 10% from where it was six years ago. Note that in 2012 mandatory spending plus mandatory debt service comprised about 66% of US spending, and thus discretionary spending is about 34% of the US budget, so inflation adjusted cuts come to about 3.4%. In nominal terms, the US budget is down to the last Budget before Obama first took office. In other words, there are little real cuts in spending, given that discretionary spending is a relatively small part of the US budget. The lesson here is that the US just removed another bearish obstacle, the uncertainty from another budget battle. Markets shrugged it off mostly, but the dysfunction on Capitol Hill has vexed credit ratings agencies and cost the US its AAA rating from S&P.